In order for Bonnie Brae to continue providing valuable life-changing services to the more than 200 boys we serve each year on our 100 acre campus, we rely heavily on the donations from others in our community and throughout the state of New Jersey. The appreciation from not only our staff, but our students, goes beyond words and is expressed through the successful program outcomes achieved each year. 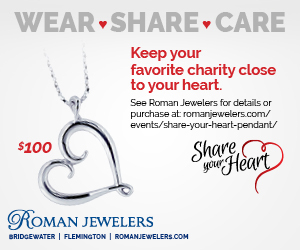 We wanted to take a moment to once again thank our friends over at Roman Jewelers for their support through their campaign, “Share Your Heart.” This wonderful campaign focuses on helping different charities through the purchase of a Share Your Heart Pendant, which was custom designed by the brilliant artisans at Roman Jewelers. For every piece purchased, they will donate the profit of the sale to your favorite charity, including Bonnie Brae! The necklace retails for $100 and for every necklace that is sold, Roman Jewelers will donate $50 directly to Bonnie Brae. The profits will be donated in the name of the buyer. This is a great way to show your support for a cause you love while holding on to a meaningful keepsake that has a story to share. 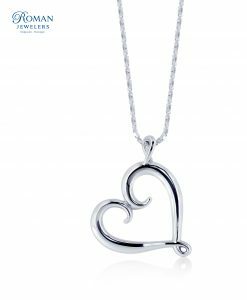 The beautiful sterling silver pendant acts as a daily reminder of your generosity towards Bonnie Brae- and of course, keeps you looking stunning! If you are interested in buying the piece, make sure to visit one of their stores in Bridgewater or Flemington, or simply complete your purchase online. Or, if you’d still like to donate, but a necklace isn’t exactly your thing, there are plenty of others ways to donate to Bonnie Brae. Even a small donation can help our boys enjoy a new activity center or a summer camp experience they may have only dreamt about before today. Thank you Roman Jewelers for your support and for keeping us close to your heart!